The fight isn’t over yet, but activists have won the first round in the battle to prevent the city’s largest gas station from being built in their southeast Visalia neighborhood. 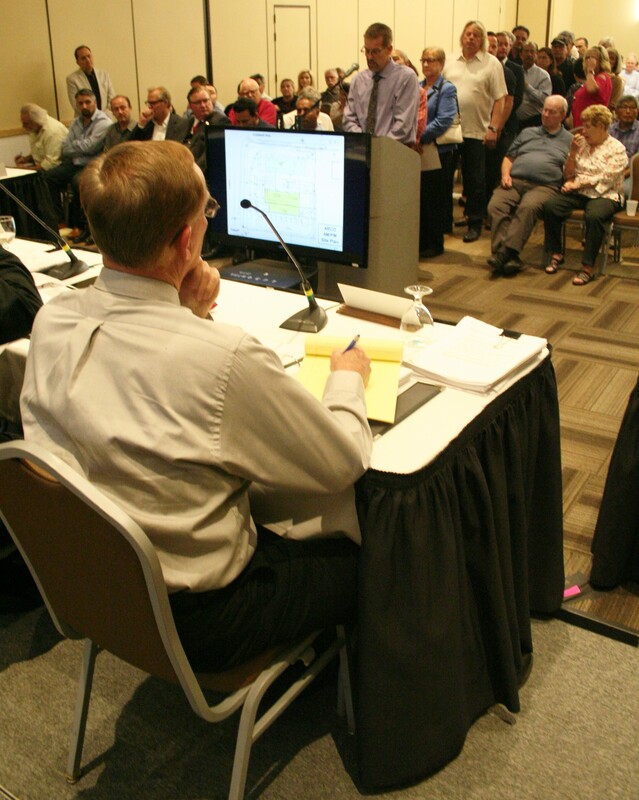 Stunned and thrilled members of Oppose ARCO rejoiced as the Visalia Planning Commission voted 4-1 Monday, April 9 to deny Chandi Group USA’s application to build a 17,000-square-foot ARCO AM/PM campus at the corner of Caldwell Avenue and West Street. The project, had it been approved, would have included a 20-hose gas station, car wash, drive-through restaurant and convenience store. Original plans called for 24-hour operations. Chairman Brett Taylor cast the lone vote supporting the plan. 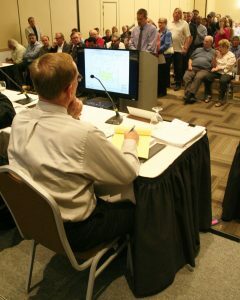 Capacity at the Visalia Convention Center was standing-room-only, with dozens lining up to speak against the project. Early in the meeting, Taylor clashed with the raucous onlookers as they jeered at supporters of Chandi Group USA’s plan and cheered those who spoke against it. Those speaking in favor of the project included the landowners and Chandi Group USA employees. Those fighting construction of the ARCO were pleased, but cautious. Chandi has vowed to appeal the Commission’s decision to the Visalia City Council. Chandi Group USA has 10 days to file the appeal. Documents must be received by 5 p.m. Thursday, April 19. There appear to be contradictory messages coming from the leadership at Chandi Group USA. According to reporting by ABC30, Nachhattar Chandi–CEO of the Imperial Valley-based gas station ownership and real estate development group–says no final decision has been reached on whether to appeal the Planning Commission decision. The elusive Chandi, who attended the April 9 Planning Commission meeting, did not address the commissioners. He also refused to discuss the situation with members of Oppose ARCO, and Chandi declined to answer or even acknowledge questions from the press. Other representatives of Chandi Group USA declined numerous requests for interviews by the Valley Voice after initially agreeing to speak on the record. The differing answers concern Hernandez, who claims to have been met with stonewalling when attempting negotiation with Chandi Group USA about Oppose ARCO’s concerns. Initially willing to talk–at least theoretically–Chandi Group USA abruptly ceased communications when it learned Oppose ARCO members had consulted an attorney. The company’s erratic behavior was commented on by the planning commissioners prior to their vote. Hernandez said she’s concerned those guarding the neighborhood will relax if they believe the fight against the developer is won. She hopes Chandi Group is acting in good faith, but the group will be ready if it’s not. Oppose ARCO continues to hold weekly strategy meetings. While staff at the city’s planning office recommended approving Chandi Group’s plan based on revised documentation–including a new sound pollution study after the first was found to be flawed to the point of unusability–it was the nature of the business that kept commissioners from giving it their OK.
A colossal gas station has no place in one of the city’s nicer neighborhoods was a sentiment repeated often by the dozens of concerned citizens who addressed the Commission. “The proposed ARCO is not right for this neighborhood,” said Donna Martin, a 31-year resident of the area and a 13-year veteran of the Visalia Unified School District’s Governing Board. Martin also countered Chandi Group’s assertion residents need the services it would provide. A gas station with a convenience store already occupies the northeast corner of the intersection, and two full-service car washes operate within one mile. A Jack-in-the-Box opened recently in the same shopping complex. “It’s not compatible with the interests of this neighborhood,” Martin said. Maile Malkonian, a resident of West Street who has seen traffic in front of her house multiply as a result of a previous decision by the Planning Commission not to connect Giddings Street with Caldwell, pleaded with commissioners not to make things worse. “Please, do not exacerbate this situation with another bad decision,” she said. “This is doomed to be a white elephant in the near future,” Malkonian said. Hernandez said she is heartened by the commissioners’ action, saying they didn’t appear to be “in it for the money” in the form of tax dollars the AM/PM would generate. She singled out two members in particular. She praised Commissioner Chris Gomez for reading the extensive documentation she provided. Their work, Hernandez says, demonstrates priority for quality of life over revenue. “They really took into account what this will do to the neighborhood,” Hernandez said. Chandi Group’s Freeman believes the Planning Commission is likely to approve a smaller filling station at the same site, and his email to Oppose ARCO hinted at what may be in store. They may use their chance to appeal to revert to a less intrusive development apparently suggested by City Hall after the Planning Commission rejected their initial plan last year. “It is possible that the appeal will also address the revisions to the scope and size of the project discussed with city staff in discussions about the project following the first ruling of the planning commission,” Freeman wrote. Freeman said Chandi Group USA, which operates other AM/PM stores in Visalia, has “enjoyed a great relationship with Visalia customers” and he took a conciliatory tone in his email to Hernandez and Oppose ARCO. Chandi Group USA will, according to Freeman, reduce the size of the project.